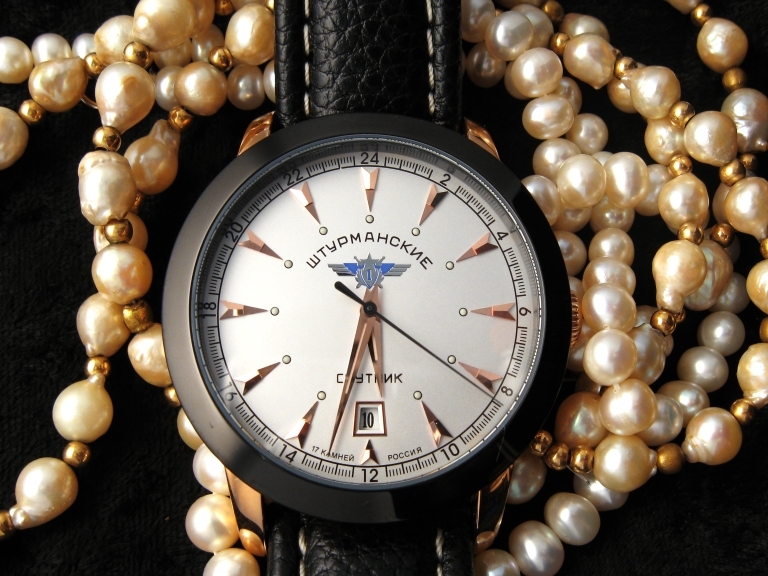 This Vostok is a simple yet elegant watch and, due to its size and style, this is arguably the only Vostok 24 hour watch which could be worn both by a man or a woman. 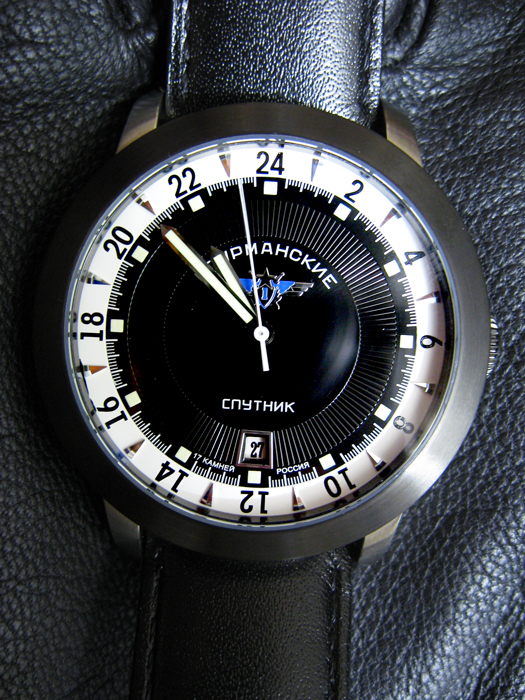 Another feature which distinguishes it from most other Vostok watches is that it does not have a screw-down crown. The mechanism inside this watch is an anti-shock Vostok 2423 (Frequency: 19800 vph; daily rate from -20 to +60 s/day; power reserve min: 38 h) and the case is made of polished steel. The screws, glass rim and crown are very slightly tinted in gold. The luming is decent, but far from the super-luminova seen on Volmax watches. Curiously, while the brand name is written in Russian (Восток) along with “made in Russia” (сделано в России) on the face of the watch, it is written in English (Vostok – Russia) on the back. Overall, the watch is well-made and it’s overall quality “feel” is better than Raketa, but not quite on par with Volmax brands (Aviator and Sturmanskie). I like Vostok watches, a lot. I got this one from a private seller for $49.95+S&H, an amazing price really for what is a very good quality mechanical 24 hour watch. 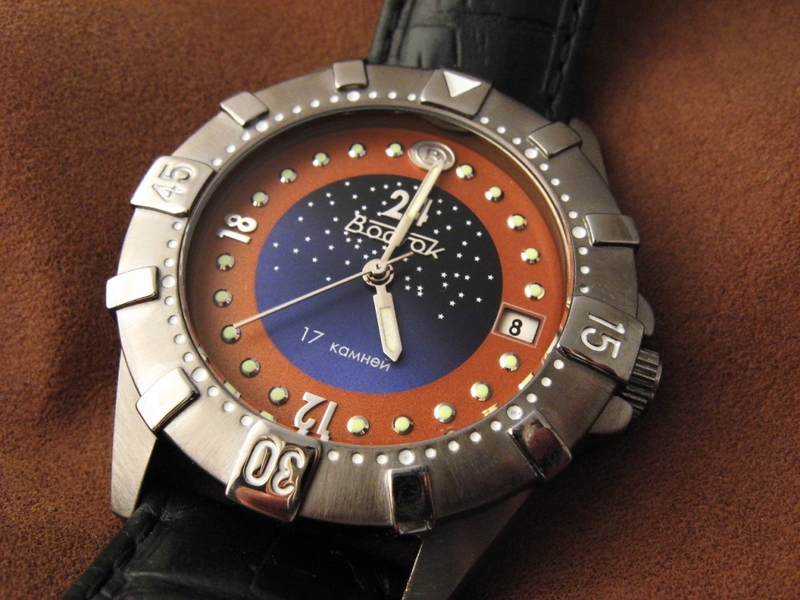 I will keep hoping that one day Vostok will resume the production of these great watches. 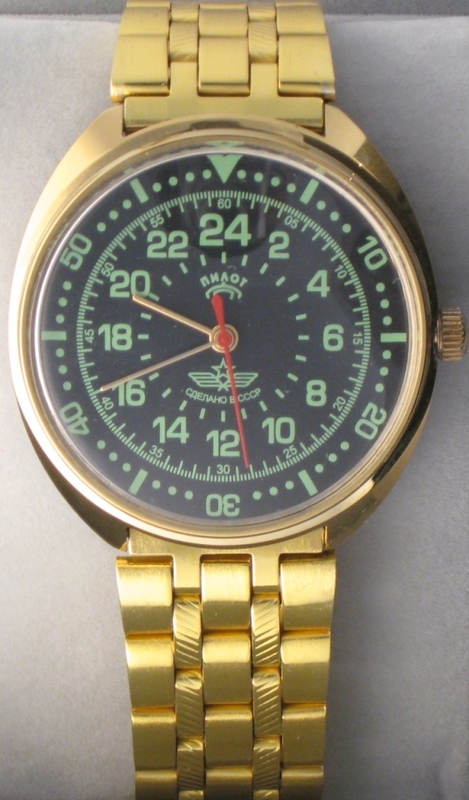 This is a limited edition watch, very rare nowadays, which was included in the “Prestige” series of Vostok watches. 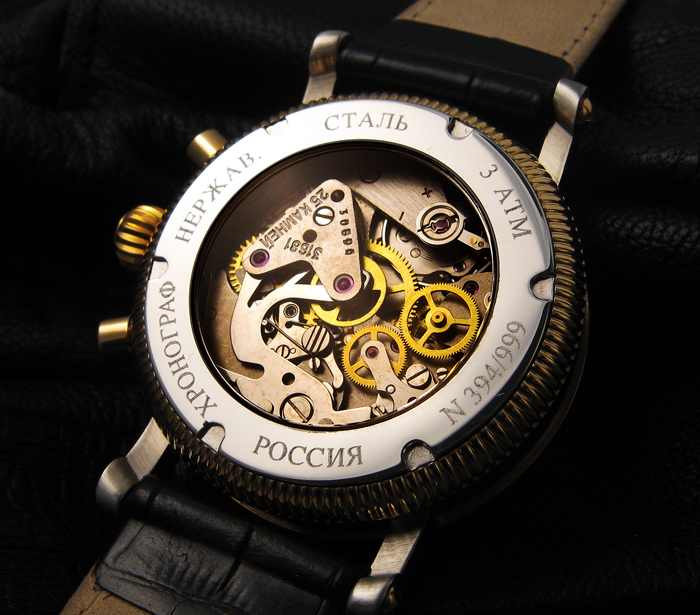 The movement inside is a Vostok 2424, which is a 24mm caliber with a 19800 frequency and an antishock balance. Event though this watch does not have a screw-down crown like the other 24 hour Vostoks, it is still advertised as water resistant. The dial itself is not the most readable dial ever as only the 12, 18 and 24 hours are indicated with numerals (the 6 o’clock numeral is replaced by a date indicator). If you are used to 24 hour watches, this is definitely not a problem, but if you are not that might be a real issue. The watch is very well made, better than most other Vostoks, I would say. It has a sturdy unidirectional rotating bezel to mark off time, and case’s plating looks very well done. I got this watch from Victor, aka ‘Zenitar’ who sells Russian watches through his store on Ebay and who is one of the most reputable sellers out there. All in all, I like this watch very much. It is very original, unassuming yet elegant, and it seems to be very well manufactored. 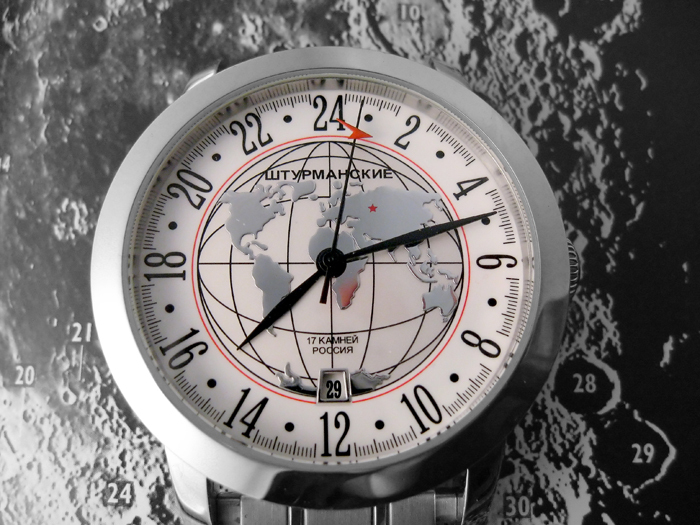 It is really too bad that Vostok has stopped producing 24 hour watches. 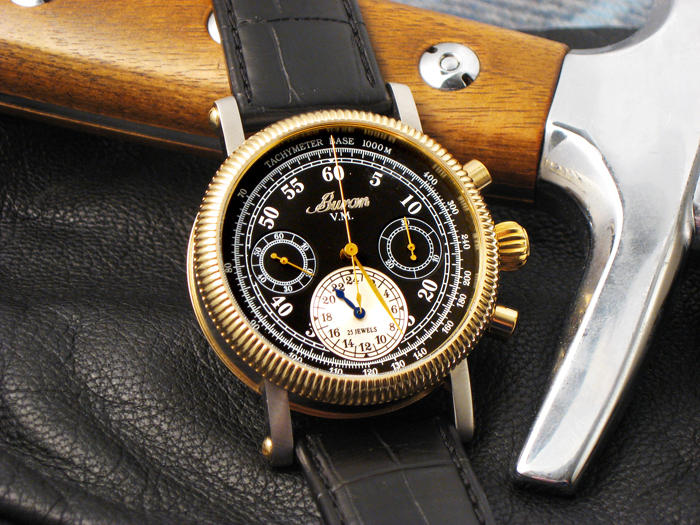 This Buran Chronograph is the Rolls-Royce of 24 hour watches and it has plenty of unique features. It is the only Russian 24 hour chronograph, it is the only Russian 24 watch with a transparent “display” back, it is the only Russian 24 hour watch with 25 ruby jewels and a Poljot 31681 mechanism which is a complication of the famous 3133 Poljot mechanism, a Russian variation of the Swiss Valjoux 7734. 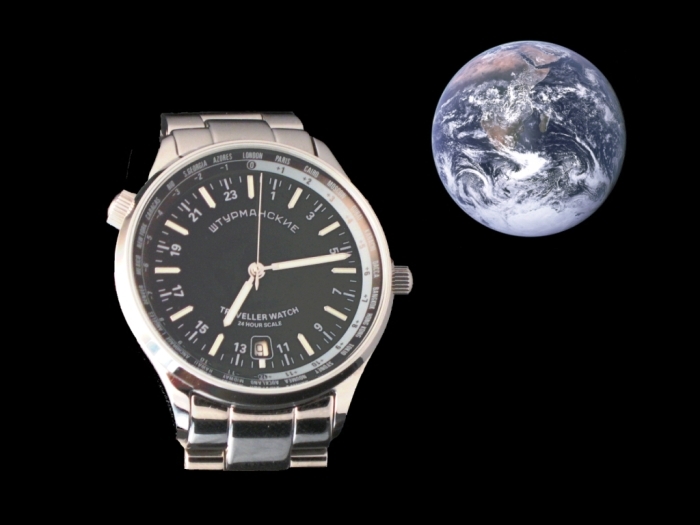 According to an entry in Wikipedia, a Poljot 3133-based watch set a space record for the longest space flight in history on the hand of cosmonaut V.V. Polyakov (– take this, Heuer, Omega, Breitling & Co.!). Predictably, it is also the most expensive Russian 24 watch, going as it does (I should write “did” – see below) for about 500-550 dollars. Pennies, really, at least if compared to “equivalent” (assuming there is such thing) Western chronographs. 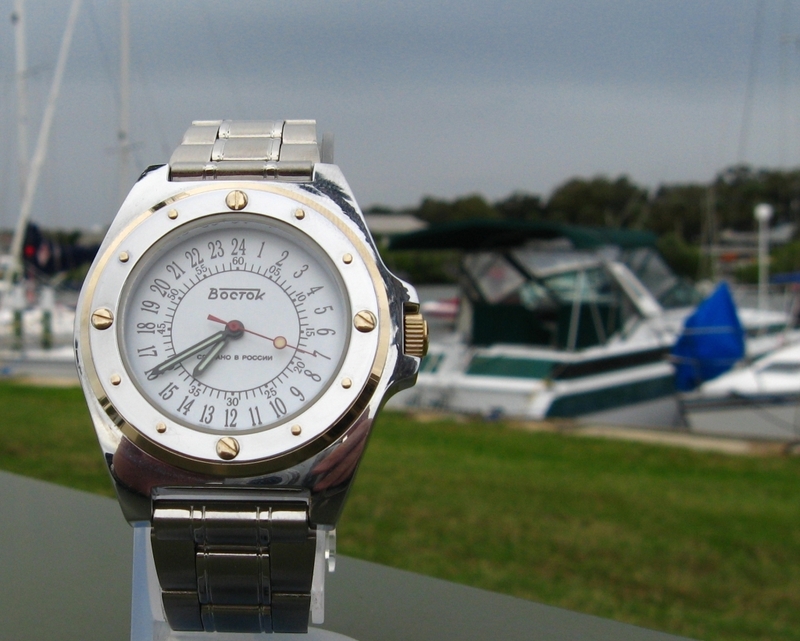 Finally, this watch is stunningly beautiful (make sure to click on the pictures to see them at a higher resolution!). Alas, this watch has now become a collectible with no successors on the horizon. Volmax, the company which produces the Buran brand, has made Buran a Swiss company and the “Buran V.M.” logo is now a thing of the past. Hopefully, Volmax will eventually release another 24 hour chronograph based on the Poljot 3133 movement as both the Aviator and the Sturmanskie brands would greatly benefit from a 24 hour chronograph in their lineups. 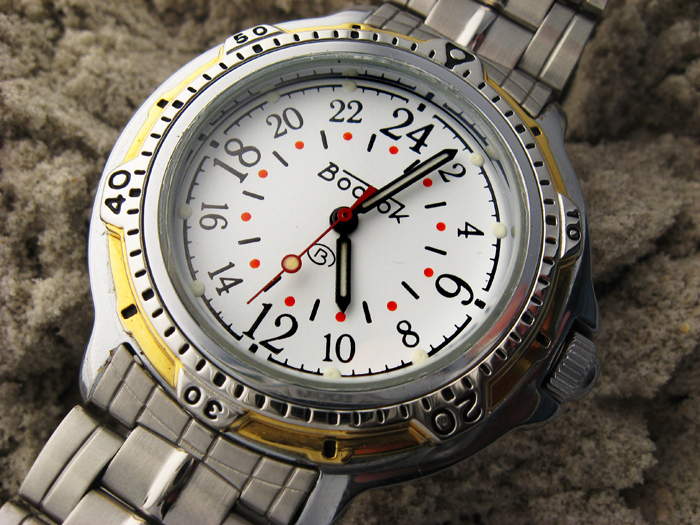 Vostok is famous for making rugged and inexpensive watches. Unfortunately, most of them are of the 12 hours kind, with a few combined 12/24 dials (which I do not consider “real” 24 hour watches). Vostok is most famous for its outstanding “Amphibia” diving watch (which can taken to a depth of 200m) and its “Komandirskie” model – a rugged watch with a military feel to it. As far as I know, Vostok made only four models with a 24 hours dial (the Vostok models 891373 – mine – 891272, 891172 and 891171), which is too bad. Another bad call is that these 24 hours models were not given the kind of water-resistance the Amphibia. This models does have “waterproof” stamped on its back, but I that could mean anything. I suspect that these Vostoks are more water resistant than the Raketas (thanks to the screw-down crown), but whether that is good enough to swim with them is anyone’s guess. Still, this is a nice and inexpensive 24 hours watch, with a reliable mechanism inside, a screw-down crown and a clear, if a little small, face. The hands are fairly luminous, and the rotating 60min bezel is neither too loose nor too tight. 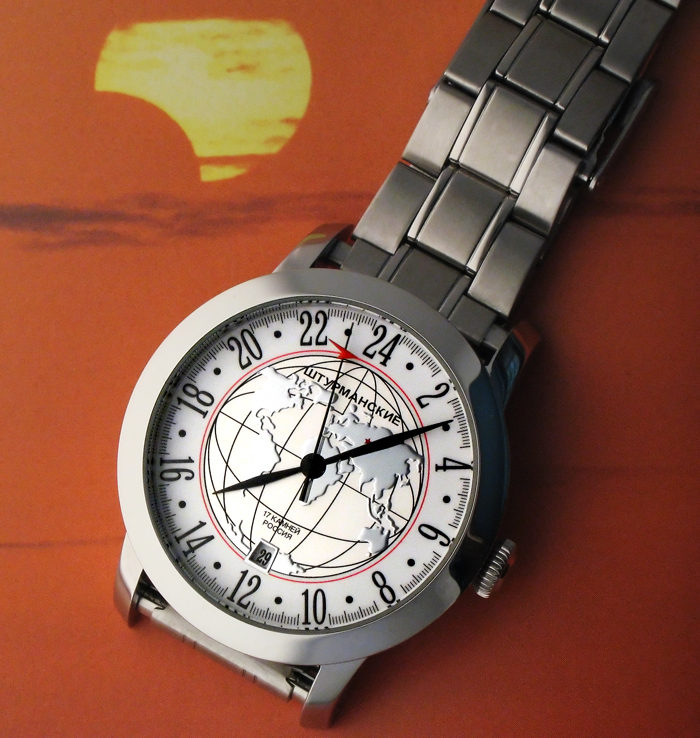 The bad news is that Vostok stopped making these watches, which is really too bad. 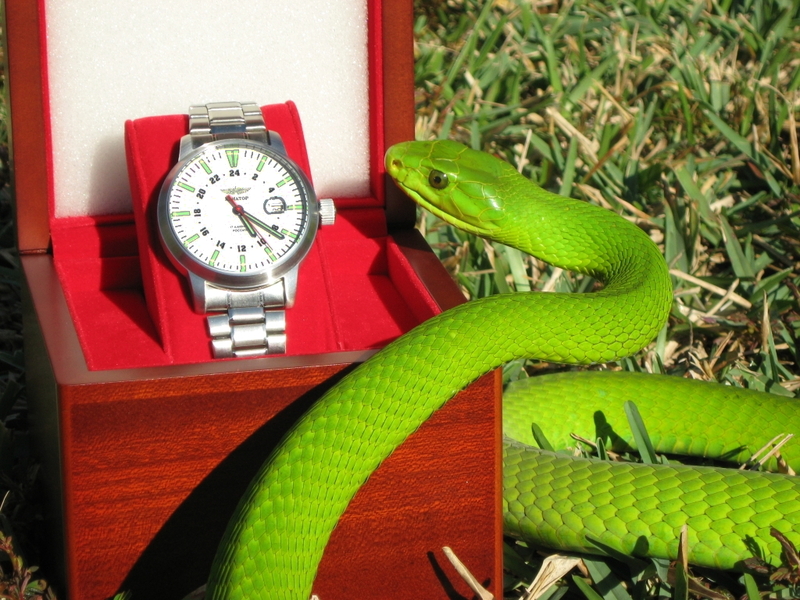 What they should have done is put a 24 dial inside an Amphibia case but, alas, this does not seem to be in their plans.